Green Valley Elementary fourth-graders on Education in Action Discover Texas Field Trip | Birdville ISD Blog! Fourth-graders from Birdville ISD’s Green Valley Elementary traveled to Fort Worth and Weatherford on an Education in Action Discover Texas Field Trip February 20, 2019 to experience what they are learning in fourth grade Texas History at the Fort Worth Stockyards and the Doss Culture and Heritage Center. During the charter bus ride to Fort Worth, students played Cowtown Bingo in preparation for their day. 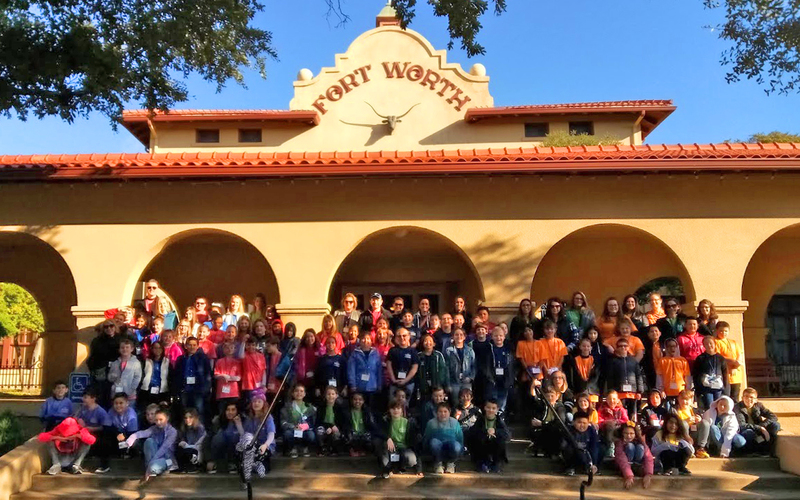 The students’ first stop was at the Fort Worth Stockyards National Historic District where they toured historic buildings, learned about the life and work of cowboys on the cattle drives, saw the Fort Worth Herd of longhorns, and took on the Cowtown Cattlepen Maze. Then it was off to Weatherford to explore the Doss Culture and Heritage Center where the students learned all about the regions of Texas, pioneer life, cattle drives, and the Goodnight-Loving Trail.